On Saturday night, London institution Horse Meat Disco takes over Barnett Hall with support from the Trax Only Crew, Father Figure, Bouffant and Kathi, with tickets on sale soon. 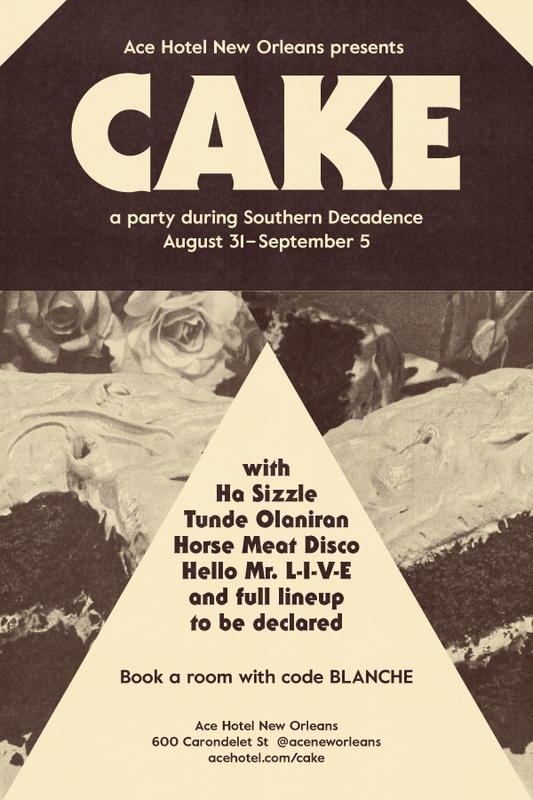 One of the most important disco club nights in the world, Horse Meat Disco focuses on production details and an outrageous polysexual crowd, having made HMD the darling of the music press and switched on clubbers alike. Now into their twelfth year, Horse Meat Disco have continued to lead the way with packed residencies at their HQ at The Eagle in London's Vauxhall, Lux in Lisbon and Tape in Berlin. Inspired by the music and inclusive ethos of New York's club scene during the '70s and '80s, the collective have garnered a unique reputation for amazing parties and unmatchable sets, the quartet of DJs each mixing their own quality blend of disco juice. On Sunday night, be sure to check out the Seancé feat. Tunde Olaniran, Flint, Michigan's brightest afrofuture star making his New Orleans debut for Southern Decadence Festival weekend. Until the full schedule's revealed next week, guests can use code BLANCHE to book a room at Ace New Orleans for Southern Decadence weekend (August 31-September 5) for a discount on their room rate, VIP access for two to the Mezzanine during shows at Three Keys, plus two free drinks anywhere on property. Southern Decadence was born in 1972 when a group of social outcasts living together in a rundown house in the Tremé neighborhood of New Orleans threw a going away fête for a New Yorker who couldn't abide the Southern heat. Everyone showed up dressed in the likeness of their "favorite Southern decadent" in honor of Blanche DuBois (parasols, fans, white gloves, etc). It was joyful and it was rebellious, and history was made. Today, it is an annual six-day event held by the gay, lesbian, bisexual and transgendered community during Labor Day Weekend, climaxing with a parade through the French Quarter on the Sunday before Labor Day. It is the largest gay event in New Orleans. The official theme for this year's 45th Southern Decadence is "Decadence Takes the World" with colors ruby red, pearl white, blue sapphire and amethyst purple.